99 Hudson Street is a 637ft (194m) tall proposed skyscraper in Jersey City, New Jersey. It will completed 2009 and will have 37 floors. Avalon Cove is a 337ft (115m) tall skyscraper in Jersey City, New Jersey. It was completed 1999 and has 25 floors. It is the 13th tallest building in the city. 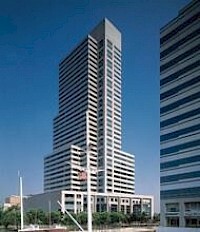 Goldman Sachs Tower (30 Hudson Street) is a Goldman Sachs office tower in Jersey City, New Jersey. It is the tallest building in New Jersey, and the tallest in the United States of any building not in its metropolitan area's largest city. The tower has 42 floors and is 238 m (781 feet) tall. The tower was designed by Cesar Pelli, who also designed the Petronas Towers in Kuala Lumpur, One Canada Square in London and the Key Tower in Cleveland. International Financial Center is a 303ft (92m) tall skyscraper in Jersey City, New Jersey. It was completed 1989 and has 19 floors. It is the 16th tallest building in the city. The Liberty View Towers is an apartment complex in Jersey City, New Jersey. It consists of the Liberty View Towers West, and Liberty View Towers East, both of which were constructed from 2001 to 2003 and have 36 floors. They tied for the 11th tallest building in the Jersey City at 380ft (116m). Although they are considered two different buildings, they rise from the same podium. Marbella Apartments is a 427ft (130m) tall skyscraper in Jersey City, New Jersey. It was completed 2003 and has 40 floors. 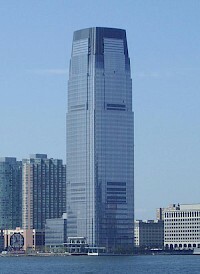 It is the 10th tallest building, and when it was completed it was the tallest residential building in Jersey City. 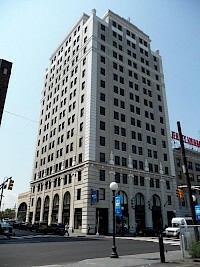 The Newport Tower (also known as Newport Office Center II and 525 Washington Boulevard) in Newport, Jersey City, New Jersey is the third tallest building in Jersey City. It has 37 floors, it is 531 ft (162 m) tall and is connected to a mall (called the Newport Centre Mall) within the complex. The mall is one of the few enclosed, regional shopping facility in Hudson County. The building was developed by Melvin Simon & Associates in 1990. The Metropolitan is a 755ft (230m) tall approved skyscraper in Jersey City, New Jersey. It will be completed in 2009 and will have 67 floors. It was designed by Arquitectonica and it will have 809 units.